I'm sorry I had to! Since St. Patrick's Day is this week I thought it was a good time to talk about luck. Mainly because people seem to think that the word lucky and hard work are interchangeable. 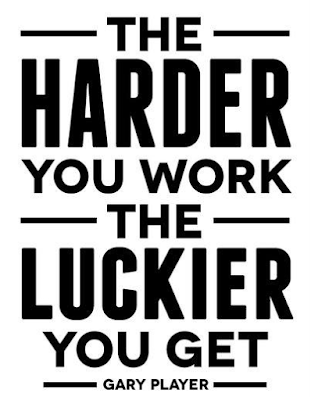 The definition of luck: success or failure apparently brought by chance rather than through one's own actions. The things we do not have control over usually do not work out in our favor. We have had countless issues with cars, our dogs health, purchasing a home, Erik's education. The things we do have control over we have had better results in. Our home, our marriage, finances, job promotions. When people see that they say we are lucky. The fact that we have our own house, two functioning cars, the opportunity to go on vacations and a pretty solid marriage is not because of luck. It is from all of our hard work. It is from planning and stressing and endless effort. We do not win things. We do not randomly find things. We do not have our wishes granted. We simple choose to keep going and create our own luck.